180g vinyl, mastered at half speed, 350gsm sleeve with UV coating, obi, sticker. We Release Jazz is ecstatic to present its fifth release (following Ryo Fukui’s Scenery and Mellow Dream, Le Cercle Rouge’s soundtrack by Eric Demarsan and Stuff Combe 5 + Percussion), the first ever live performance and recording by Marc Moulin’s sought-after jazz-funk band Placebo, captured at Casino Kursaal during the Montreux Jazz Festival in 1971 and never released before. 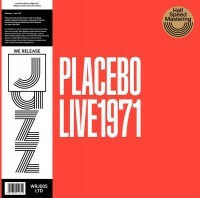 Placebo’s Live 1971 is available in a limited edition 180g vinyl mastered at half speed, housed in a 350gsm sleeve with UV coating and an obi strip. June 17th, 1971, the Montreux Riviera, its delightful microclimate and postcard scenery, its fabled music history and the luscious wines of the region. A dream setting for Marc Moulin to lead his ensemble on a 26 minutes+ jazz adventure - Nick Kletchkovsky on bass, Freddy Rottier on drums, Johnny Dover on bass clarinet, Alex Scorier on soprano saxophone, and Richard Rousselet on flugelhorn. The magic of that night is dripping through Placebo’s sumptuous "Showbiz Suite", a soulful piece in two parts in which every instrument gets enough room to shine, smoothly navigating between cozy cognac-by-the-fireplace funk and heartfelt grittiness, served with a pinch of Soft Machine vibes. It’s the night Placebo was born, when foundations were laid for three classic albums: Ball of Eyes (on which you can hear a shorter studio version of "Showbiz Suite"), 1973, and their final self-titled album. Born in 1942 in Ixelles, the multifaceted Marc Moulin had one of the most fascinating careers in the history of Belgian music, from his jazz roots and Placebo to founding electronic disco pop band Telex ("Moskow Diskow", "Rock Around The Clock"…), producing a vast array of French and Belgian hits (notably for Philip Catherine and Lio), pioneering downtempo and electro jazz with three albums on Blue Note, and exploring other avenues of expression such a radio hosting and comedy. He sadly left us in 2008. His incredible legacy shall live on. Peoples Pleasure & Alive And WellDo You Hear Me Talking To You?